Last year, Sony released its Xperia X Compact, a small mid-range smartphone. Now, Sony is back with another compact smartphone, but this time it's a flagship. In our final review, we explain exactly what this device is capable of. Since the debut of its Xperia X3 Compact in 2014, the IFA has become an important date for the Japanese manufacturer. Each year, Sony presents us with a new smartphone during the event, but unfortunately it disappointed fans of compact smartphones last year, because the model presented was a mid-range device and not a high-end smartphone. 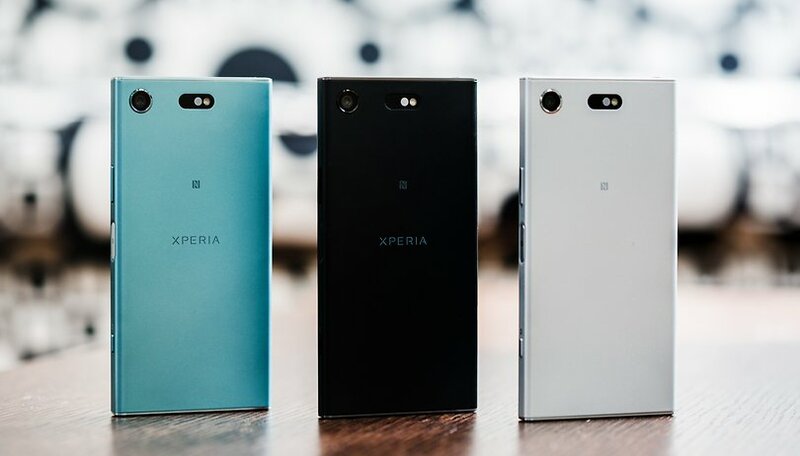 This year, with the XZ1 Compact, Sony is making a big comeback in the compact smartphone market. We find in this small device almost the same material as in the high end of the series: the XZ Premium. Having more powerful (and expensive) hardware obviously raises the cost of the device: while the mid-range X Compact cost $500 in 2016, the flagship XZ1 Compact costs $600. That said, if you are looking for an Android flagship with a small size, you have no other compact alternatives. For this device, you get to choose between black, silver, blue and pink colors. Regarding the design, Sony remains faithful to its Xperia XZ range. The screen is HD and 4.6 inches, but unlike many flagships today, its bezels are rather thick. This is due to the construction of the device and the components used. The fingerprint reader alone takes up 1.5 mm of space on the edge of the screen (on the power button). Above the camera, we can find the 19 MP Motion Eye camera, with its 3-layer sensor, right next to the speaker. On the lower edge of the screen we find the second speaker and the Type-C USB port. Sony has learned from the past, and places the processor away from the photo sensor. That said, a heat conducting plate with a pipe was added to allow heat to escape the device, a useful thing for when you want to record video in 4K, for example. It is a shame that the design isn't totally premium. The Sony Xperia XZ1 Compact is mostly plastic, made more stable using carbon fiber. The choice to use plastic wasn't about cost, it was technical: with plastic, the antennae can be placed behind the rest of the equipment in the device. This allows the Xperia XZ1 Compact to be compatible with 4G Cat 15, which allows a download speed of up to 800 Mbit/s. Like the XZ Premium, only the top and bottom are made of metal. In any case, the Xperia XZ1 Compact is protected from dust and water according to IP65/68 certification, while the Xperia X Compact was not. The big advantage of this smartphone is obviously its size. Thanks to its compactness, it's easy to handle even with just one hand, which is a real treat. In terms of display, the XZ1 Compact offers what's usually found with a screen of this size, so don't hold your breath for a 4K screen or HDR on this 4.6-inch IPS display. That said, with such a small screen it would be totally unnecessary. Sony offers HD definition with a maximum brightness of 600 nits. For protection, this little Sony device uses the same glass as its upscale cousins: Gorilla Glass 5. During our review, the screen performed well and was bright enough to use in direct sunlight, but could also get dim enough to use in the dark without hurting your eyes. As explained above, the great advantage of this device is its small size: with a diagonal of 4.6 inches, it is possible to use with just one hand without the slightest problem. We find a little surprise software interface level. Sony will offer this smartphone (and the XZ1) with Android 8.0 Oreo. That said, it modifies the interface slightly by overlaying its UI, with which it isn't possible to access the app drawer via a swipe from bottom to top, as it offers a more conventional launcher. Sony offers several features to make it easy for new users to adapt to the system quickly. Unfortunately, there are some small logical quirks in the interface that may make things less intuitive. For example, the user has to launch the new 3D scanner for the Motion Eye camera, while the other special features of the camera are found in the photo app. Fortunately, Sony learns from its mistakes. On this version based on Android 8.0 Oreo, it is no longer necessary to use a specific, separate app to record videos in 4K: you can now enter the camera app options and change the resolution there. Thank you for a more intuitive solution, Sony! The XZ1 Compact aspires to be a tiny flagship so it must have high-end hardware to match. Its configuration is identical to that of its brothers, the XZ Premium and XZ. With a Snapdragon 835, 4 GB RAM and UFS memory, the XZ1 is exactly like the XZ Premium and the XZ1. The only difference with the XZ1 is the size of its internal memory since the compact model only has 32 GB. Rest assured, this can be expanded up to 256 GB with a microSD card. On paper, this smartphone seems to be able to stand up to other high-end models on the market. We have submitted it to several benchmark tests and can only note that it is as efficient as we imagined it. In everyday life, the Sony Xperia XZ1 is incredibly fast and shows no sign of weakness. We didn't catch a single instance of slowing down. The relatively low-definition display and its small size certainly play a role in this, but the result is nevertheless a delight and we are excited to finally find a flagship at this size. If you are looking for a smartphone that's both compact and powerful, then this device is for you. As for the sound, Sony has always been a winner. Just look at the history of the brand and its other products, we can quickly see that the Japanese giant has proven itself with Sony Music and its legendary Walkman brand. With its stereo speakers on the front of the device, the Xperia XZ1 Compact shows its muscles. Of course, and like many larger smartphones, it lacks a loudspeaker worthy of its name in order to offer good bass, but if we take into account the size of the device the result isn't bad. From a technical perspective, Sony pulled out all the stops for this device: Bluetooth 5.0, HD aptX, High-Resolution Audio, LDAC, etc.. This is the combination that Sony always puts in its high-end smartphones. Of course, the user needs to use the necessary, compatible hardware to be able to get the best quality, be it a HiFi system, headphones or headphones. At the main camera level, the Xperia XZ Compact has once again been inspired by the XZ Premium. Nothing changes at the hardware level, but Sony has worked on its software. The "Predictive Shoot" feature is now triggered with a simple smile (as long as someone is in its field of view). In addition, there is also a hybrid prediction autofocus, which will keep the focus on an object moving over a series of shots. With its adaptive autofocus, it's possible to take up to 10 frames per second. Sony has also placed something of interest in the front camera: it has two focal lengths, one of 12.5 mm and 120 degrees, the other of 28 mm and 80 degrees. The latter is achieved by interpolation and trimming of the image. In order to be able to take good selfies in a dark environment, the entire display can be used as a flash. The Motion Eye Camera can use an app by Sony to analyze objects in 3D. From faces, heads, foods or other objects, you can create objects in 3D with a little practice. You can then share these digital objects with your friends, from simple images to animated GIFs or MP4 videos. As Sony records 3D objects in OBJ format, it is also possible to use them with a 3D printer to create real objects in 3D. As my colleague Luca said in his review of the Xperia XZ1, there's a learning curve for this feature. It's interesting, for the average user, 3D scanning will be something fun to try and get the hang of, but not something one will use in everyday life. The XZ1 Compact shares many of the same technical specs as another device introduced by Sony at the IFA: the XZ1. This is also the case with the battery, as even the rather large XZ1 has a capacity of 2,700 mAh. The XZ1 Compact has adaptive charging with Qnovo and support for Quick Charge 3.0. With a screen resolution lower than that of the Full-HD XZ1, 5.2 inches, the battery life proves sufficient. It's a shame that Sony has been so stingy: there is no Quick Charge charger in the box. If you want it, you have to spend even more money. The battery life of the XZ1 Compact is good. On the PCMark benchmark, at maximum brightness, it still managed to hold for 6 hours and 35 minutes. At 50% brightness, it manages to hold for 14 and a half hours. In everyday life, the phone managed to last through a whole day and until the evening still with 30%. Of course, usage varies from one person to another, so your mileage may vary. It should be noted that since the Xperia X, Sony's smartphones have Qnovo charging technology. In the settings, you will find the option in the battery settings. When activated, the system will analyze the charge and adapt it at night to wait to reach 100% just before you wake up. The battery is quickly charged and as soon as the level drops sufficiently, a new charging cycle begins. As each cycle affects the life of the battery in the long run, the batteries of Sony devices have a much longer life by default. There's simply no direct competition for Sony's XZ1 Compact, which combines a small size with big power. While it is true that it has only 720p definition, for a screen size of 4.6 inches, that's not a problem at all. What can hinder it, however, is the quality of the camera: despite the 3D scanner and SuperSlowMotion mode, it didn't really convince us. If you are looking for a compact smartphone that has the technical potential of a true flagship, the Sony Xperia XZ1 Compact is the one for you! Great to see a review that really appreciates Xperia Compacts for what they are: powerful, human hand sized phones with good battery life. Tired of idiot reviewers trying to goad Sony into, for example, crippling battery life by ramping up the pixel density/making the screen a pointless 1080p. Thanks for the sanity! Agreed. The 4.6" screen is nice but when you have bezels that big top and bottom, it becomes essentially the same size as the LG G6 which fills its screen. If that same 4.6" screen filled its screen borders, then it would truly be compact.